The Jelly and Bean Reading Scheme begins with the books in the AB Starter Pack. The material and ideas in this series are reinforced in two parallel series, the First Words Series and Tom and Bella Series 1. All three series are for the Phonic Phase 2 of Letters and Sounds and the Pink book band. to provide the simplest books for children to read by themselves when they are first beginning to learn to read and write. to introduce the most common words in English – initially these are ‘a, on, in, and, the’ – as connecting words for nouns so that children quickly get used to these words in texts. The main aim of this book is to introduce the words ‘cat, hat, mat, on, a’, in text and in pictures as a means of introducing the letters ‘c, a, t, m, h, o, n’. By realising that three separate letters are used to write ‘cat’, children may be introduced to the idea that each letter corresponds to a specific sound. By carefully articulating ‘cat’, the sound of the initial utterance corresponding to ‘c’ may be brought to children’s attention. In a similar manner, the sound of the vowel in the middle of the word, represented by ‘a’, may be brought to their attention, and also the final sound, made by closing the teeth together, ‘t’ may be brought to their attention . In this way, the letters ‘c’, ‘a’, ‘t’ in written words may be shown to correspond to three articulatory gestures in spoken words. This process is known as learning letter/sound correspondences. Similarly, the letter/sound correspondences for ‘h’ and ‘m’ in the words ‘hat’ and ‘mat’ may be made explicit to children. However, it is often difficult for children to abstract separate sounds from words in this way, because speech is not made up of separate sounds. Speech is a continuously changing dynamic stream of sound, and the words in it are not differentiated by gaps as they are in written text. To help children who do not find it easy to isolate individual sounds from words, teachers may find it helpful to split the words into ‘body and coda syllables‘. It is easier to articulate an initial consonant together with the vowel that follows it, because, as humans, we speak in syllables. The words will be spoken as ‘ca-t, ha-t, ma-t’, where ‘ca, ha, ma’ are the body of the syllables and ‘t’ is the coda, or final consonant. Teachers may also split the words into ‘onset and rime syllables‘. In this way children learn to say the initial consonant, the onset, and the rhyming ending ‘at’ in all three words, ‘c-at, h-at, m-at’. The initial consonants in the words are then differentiated and their pronunciation can be brought to the children’s attention. The overall objective is for children to learn how to split the words according to the letters they see written down, in such a way that they learn the shape of each letter and the sound of the articulatory gesture it represents within these simple words. The other main objective is to introduce the word ‘on’ as a joining word. When they understand what ‘on’ means, children can be taught to split this word into the two speech gestures corresponding to the letters ‘o’ and ‘n’. The word ‘a’ is also used in this first book. It may be articulated in the same manner as it is in the words ‘cat, hat, mat’. However, in normal speech, ‘a’, as a word written by itself with a gap either side, is normally articulated as a ‘schwa’, a sort of neutral vowel sound similar to that heard at the end of word such as ‘butter, pizza’. Children have to get used to this straight away in reading and writing. It is left to the teacher whether to explain this, or to simply pronounce it for the children so that they learn it as a whole word – even though it only has one letter. The main aim of this book is to reinforce the letter/speech gesture correspondences of ‘c, a, t, m, h, o, n’ in a few more words, i.e. ‘cot, hot, man’. Children should notice that the middle letter in ‘cot’ is different to that in ‘cat’, and notice that by changing one letter the word changes. 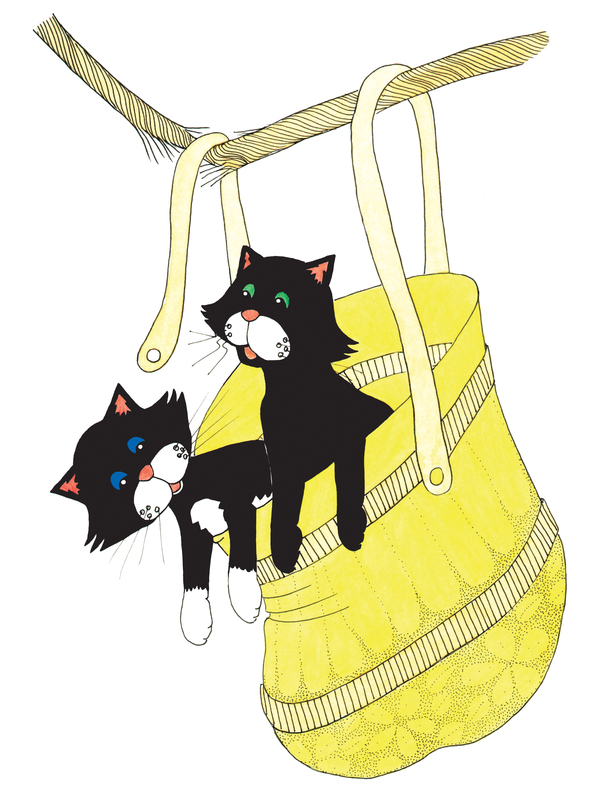 The illustration of a ‘cot’ shows children that a ‘cot’ is different to a ‘cat’. From the words ‘cot’ and ‘cat’ children can also differentiate the sound of the vowel in the middle of each word, the medial vowel. Similarly, in the written word ‘man’, only the last letter has changed from the word ‘mat’, but it is obvious from the picture that a ‘man’ is not the same as a ‘mat’. These two words bring to children’s attention the difference made by changing the final letter in the written word. This change of letter corresponds to a change of word, a different word is spoken. It is the careful identification of the letters in written words, and the order in which they appear, as well as the sounds they represent in their pronunciation, that helps children to decipher one written word from another. This book introduces the concept ‘in’ rather than ‘on’. The pictures illustrate one object ‘in’ another object. In this way children can see the differences between ‘in’ and ‘on’ and learn that ‘i’ and ‘o’ represent different vowel sounds in these words. The words ‘box’ and ‘big box’ are introduced. The word ‘box’ can be split in the same three ways as described above, ‘bo-x’, b-ox’, ‘b-o-x’ so that children learn the letter/sound correspondences of ‘b’ and ‘x’. In the word ‘big’, split as ‘bi-g, b-ig, and b-i-g’, there is only the ‘g’ letter/sound correspondence to learn. The word ‘bat’ is illustrated as a cricket bat, a flying mammal, or a swing ball racket. In this way children come to realise that although the same letters are in a written word, the word may have more than one meaning. As before, teachers may split the words into ‘t-in, b-in’ to reinforce the rhyme and pick out the initial consonant, and ‘ti-n, bi-n’ to pick out the final consonant /n/, as well as splitting the words into their phonemes, t-i-n, b-i-n. The word ‘and’ is used in the text when the object is neither ‘in’ nor ‘on’ another object but both objects are present in the illustration. Also, ‘and’ consists of a vowel and two adjacent consonants. It is easier for children to say this as a whole word, than it is for them to try to split it into phonemes. Adjacent consonants in all English words are easier to articulate together, rather than to articulate the phonemes separately. This book introduces the words ‘dog’ and ‘log’ in text, and in pictures, as a means of introducing the sound/letter correspondences for ’d’ and ‘l’ and reinforcing the letter ‘g’. The words ‘log, frog’ are used to maintain the same rhyming ending ‘og’, in a similar manner to ‘cat, hat, mat’ in book A1 and ‘bin, tin’ in book B2. The two letters ‘f’ and ‘r’ are introduced separately in books A4 (r), A5 (r), B5 (r, f), A6 (f). The word ‘and’ is used as a connecting word. Pictures are used to illustrate the difference between ‘on’ and ‘and’ as concepts. The letters ‘b’ and ‘d’ are both used in this text, ‘bad, mad, dog, and, bat’. Children often get these letters mixed up. They are almost mirror images of each other and the way they are formed helps children to differentiate them. The letter ‘d’ is formed by an anticlockwise movement to draw the oval before going up the stick and back down it. The letter ‘b’ is formed by first going down the stick, then back up halfway, before making a clockwise turn to draw the oval. Please see our Writing Activities for practice sheets. All the letters of the alphabet printed in the Sassoon Primary Infant font are available free from our website. Click on Free Resources on the homepage. The words ‘bed, mud, tub, rug’ are used in this book to introduce the sound/letter correspondences for ‘e’, ‘r’ and ‘u’. The letter ‘s’ is also introduced in this book. It has not been possible to find a simple word beginning with ‘s’ that fits with the rest of the text. This means that the small letter ‘s’ is only used at the end of the word ‘cats’ as the sound /s/. The word ‘the’ is introduced in this book as a whole word made up of the letters ‘t’, ‘h’, ‘e’ written in that order with a space either side. These letters are not pronounced in the same way as they are in the simple CVC words already used, i.e. ‘tin, hat, bed’ . At this stage letter/sound correspondences do not help children to pronounce ‘the’. They have to learn ‘the’, pronounced as a whole word, and remember the letters used to write it. The letter ‘r’ is introduced as an initial consonant. The word ‘rug’ is used to do this. Some children may not have met this word before and teachers may have to explain that a ‘rug’ is usually a thick, fluffy mat. A similar problem may occur with the word ‘tub’. The picture should help with this problem. The joining words ‘a, on, in, the’ are used in this book. This book uses the words ‘pan, cup, hop’ as a means of introducing the letter ‘p’ at the beginning and at the end of a word. The letter ‘u’ is reinforced in the words ‘nut, bug, bun, cup’. The word ‘bug’ is used too refer to different insects, e.g. a spider, a ladybird, a beetle and a grasshopper, so that children do not try to guess the words from the pictures. The four joining words ‘a, on, in, the’ are used. The letters ‘b’ and ‘p’ are both used in this book. The letter ‘d’ is avoided. Children may need extra writing practice to differentiate ‘b’ and ‘p’, as well as ‘b’ and ‘d’. The First Words Series reinforces the above letter and word work in books 1-5. It then introduces sentences beginning with ‘I am’ and ‘I can’ in books 6, 7 and 8. Tom and Bella Series 1 reinforces the above work in books 1-4. It then introduces sentences, including capital letters, containing the verbs ‘is, has’ in books 5 and 6. The rest of the letters of the alphabet are introduced in the books A5-10 and B5-10. Sentences, including syntax, grammar and meaning are used consistently therein.